Halfway between Palma and Valldemossa, not far from the Universitat des Illes Balears, you’ll find a small clutter of houses, a bar/restaurant and a small church with an imposing campanario (bell tower): the Llogaret of s’Esgleieta. The hamlet grew from a single dwelling during the late 18th century. 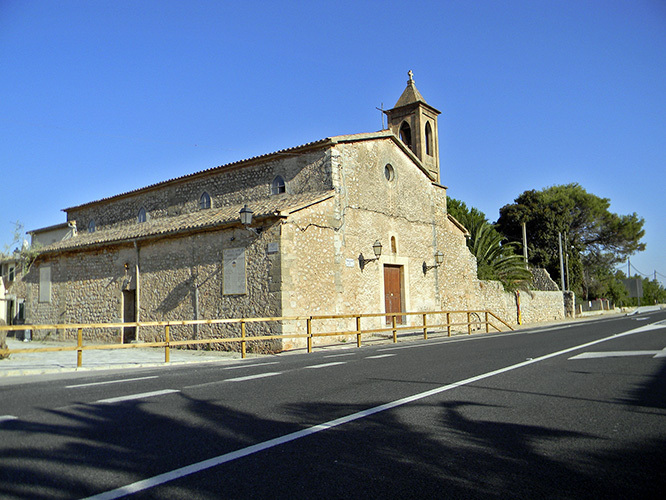 The Esgleieta de Santa Maria d’Olivar was built much later, in 1860. In the old days, s’Esgleieta was a welcome halfway house on the voyage from Valldemossa to the capital, breaking the arduous journey into two more palatable rides. Then, most trips would have been undertaken on horseback, in a donkey cart or simply on foot. At today’s velocity of traffic, no-one bothers to stop any more. The bar is doing only sluggish business if indeed any business at all. The church only holds service once a week, on Saturdays, when the vicar of nearby Esporles is on duty. The church of s’Esgleieta is adorned with a tablet in honour of Santa Catalina Tomàs who is reputed to have achieved one of her three accredited miracles in a place near here, Son Termens. No such luck for a young chap from Bohemia who was struck down near s’Esgleieta when on his way from his master’s house, the Archiduque Luis Salvador, to his sweetheart in Palma. You might want to embark on a walk from s’Esgleieta to Valldemossa, on a charming footpath along the Torrent de Valldemossa. The trip would probably take you just under three hours for the way up; or two hours for the way down. You could walk one way and get back to your own car by bus, on the return trip. Alternatively, you could walk from s’Esgleieta to Raixa and discover a nice piece of Mallorcan landscape. November is usually a perfect time for walks and hikes. The photo was taken near Esporles, Mallorca, Baleares, Spain. The date: July 7th, 2011. The time was 18:39:53.